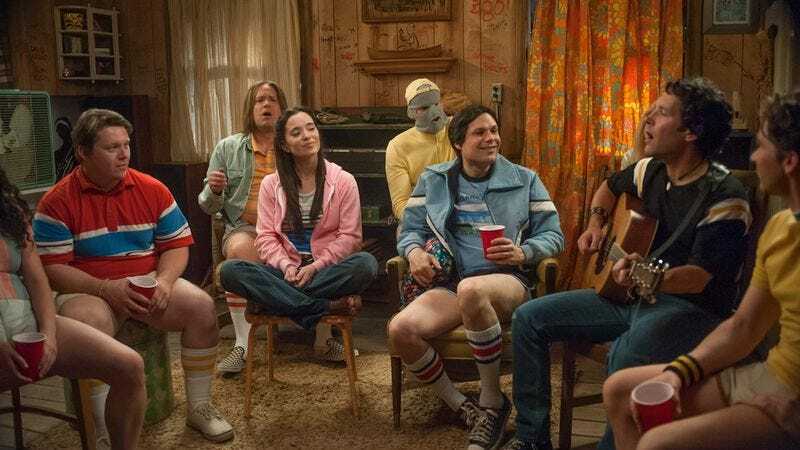 Hey, we’re not the only ones maybe a little over-excited about the debut of the Netflix prequel series Wet Hot American Summer: First Day Of Camp. Addictive home-improvement site Houzz has published a whole list of tips that will help you turn your own home into a reasonable replica of Camp Firewood. Our favorite camp has a multitude of superlative design elements that Houzz is helpful enough to detail—and credit to WHAS art department coordinator Stacee Hammond, set director Cassandra Fuote, and costume designer Leslie Schilling—with appropriate at-home suggestions. What about those community-friendly porch offerings, with plenty of room to hang and plan your 10-year reunion, right down to the minute? Houzz agrees that steps and railings can make excellent perching posts. Of course, in a perfect world, all the walls would be wood-paneled, but we can’t have everything.